Modern technologies influenced all the spheres of our life, even the way we communicate, date and get married. Nowadays most of the love stories start online. Nowadays, people prefer to find a match online than talk to somebody on the street, in the bus or café because it’s faster and easier. The first wave of online dating started in 1995 with the launch of Match.com. However, with the release of Tinder, the number of people searching for love online has grown exponentially. Tinder is a giant of the dating industry. If you ask on the street people whether they have used Tinder, the majority will say “yes”. Tinder is widely used by young people and people above 30 as well. In other words, this app is an international tool that people of all the nationalities and all ages use to find love. However, the question pops up: What is the reason for such success of Tinder? It much harder to say “Hi!” to the girl you have met in the park than simply click ‘Like’ on Tinder. Simplicity is that what people like about “Tinder. Swipe. Match. Chat. Date.” is the concept of Tinder and the reason for its outstanding success. Tinder is a freemium dating app. Every single person can download iOS or Android app in a few seconds and start using it, there aren’t multiple complicated registration stages. You just log in with the help of your Facebook or Instagram account, add some personal description, at least one picture and voila, you are on Tinder. Then you just need to specify the age range and gender preferences, and start “swiping”. Swipe to the left means “Dislike” and to the right – “Like”. Mutual swipes will result in a match. Simple as ABC. One more thing you have to know about Tinder is that it takes some data from your Facebook profile, such as age and occupation, and it offers matches based on your current location. That’s how Tinder works. Minimum efforts for maximum matches. Registration through Social Network. It will help to get more personal data like age, gender, studies, and place of work, and reduce the number of fake profiles. Advanced matching algorithms. A tinder-like app should enhance the possibility to be matched with “right” person and reduce random matches of people that have nothing in common. Geolocation. This is a key feature of the app, that allows to set the distance and meet your match faster. Private Chat (and possibly Voice Chat). One of the basic features for communication before the date. Push Notifications. It will help to keep the user informed about new likes, matches, and messages. Rewind Button. In case the user swiped to “Left” accidentally, they can go back and swipe to the “Right”. Who likes you. Allows the user to see who already swiped right on them. Multi-location. For the user who is planning to travel to another city and would like to get a match before arrival. Profile “Boost”: Temporal increase of the user’s popularity in the current location, Basically, the algorithm shows user’s profile first to more people during a short period of time. When you build an application like Tinder, you definitely expect your efforts and investments to pay off. There are several ways how you can attract your target audience and increase your revenue. Check out 3 simple methods on how to engage new users and improve your business. In-App Purchases. You can set the limits on the number of matches per day and provide the opportunity to buy more matches. Also, you may let the person purchase additional “Super Likes”. This way you will help the client and will increase the profitability of your business. Advertisements. You can try to add advertisement inside your application such as small banner ads or full-screen ads after an action. However, too much advertising tends to annoy users and push them away. Premium (Paid) Version. Establish both free and paid versions of the app, adding to the second one some more exquisite features. Building a Tinder-like app is definitely not an easy task, it requires hours of hard work and patience. Nevertheless, it is not something impossible. Check out the five steps on the way to your own dating app and start taking actions right now. Step1. You need to come up with a catchy name that can be easily remembered and shared on Social networks. Step 2. Identify the main features of your dating application and the target audience of your app. Unlike Tinder, you may focus on the smaller market. You can create a dating app specifically for travelers, artists, youngsters or people over 40. Love has no limits. Step 3. Gather the team of developers and designers have an experience in application development and can come up with the new ideas and not only copy Tinder. Step 4. Start bringing your dating application to life. In order to build the Tinder-like app, your team will have to use a certain programming language, number of advanced tools and frameworks. You can check out the technology stack for classic dating application below. Platforms to build and test your app: AWS Mobile, built.io Backend, Parse etc. Platform for custom designed maps: Google Maps, Mapbox, Leaflet etc. Marketplace for Distribution: Google Play, Apple Store. Step 5. When the application is developed, it isn’t the end. In order to make this project successful, you have to come up with a marketing plan that will keep the number of users constantly growing. 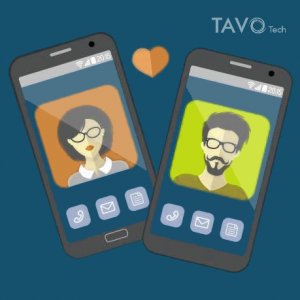 If you would like to know more about how to develop an application like Tinder or already have an idea of a dating app, do not hesitate to contact Tavo Tech for a free consultation. We will answer all your questions and clear up your doubts. Let’s build you dating app together. This entry was posted in Uncategorized and tagged Application, Blog, How-to, Software development. Bookmark the permalink. ← Offshore Software Development. Does It Make Sense?